Racers, start your engines! NASCAR Racers is a very cool game for the Gameboy, especially of you like racing games. But hey, if you don\'t like racing games, there\'s always the flying part...and the rocket booster part...and the on-two-wheels-part...okay, I\'ll quit. The game play is - good. The AI is not that hard to beat, the \'levels\' are just different variations of each other. On single race, you can pick from Jungle, Egypt, Europe or St. Petersburg. And on all of these, there\'s four variations. It gets boring after a while, but with four people to choose from, it\'s pretty fun, at least for a while. On Championship, you go from level to level, and try to get big points - because if you don\'t get enough points each round, you\'re out of the championship. Championships are fun, but frustrating and boring, too. Gameplay is a resounding 75. Okay, on the sound, it\'s not much. The typical repeat, repeat, repeat of a bleepy \'soft rock\' tune. It\'s kinda neat, but nothing I want to listen to for more than fifteen minutes. The sound effects are not that awesome, either. I\'ll say it again: what do you expect from a Gameboy game? It\'s all kinda \'pixilated,\' if you will. You hit the boosters, it does a small bleep, and that?s it. Let me put the sound like this: it?s seriously to the point where I just keep the sound off. The sound?s score? 65. 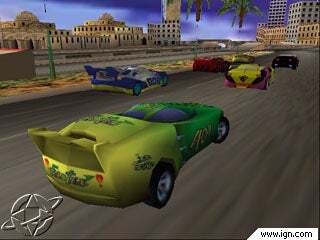 If you?ve ever seen any of the NASCAR Racers movies, you would know that there?s five people that race on the most awesome tracks. Four are good, one?s not so good. You can play any of them (at least, their cars) on any of the sixteen tracks - but not the tracks I expected. The tracks are just flat land tracks. This is not up to the movies? standard. None of the tracks twist and turn or do big figure eights. That?s the reason I bought this game - for the tracks. But enough of the tracks. Other than the fact that you can be one of the five drivers that race, there?s not really a storyline. I?ll give the storyline a 75. I?ll say this proudly - this is about the only true E rated game out there! There?s nothing I have seen that could be considered offensive to Christians. This is a real racing game, with nothing that I wouldn?t let a three year old play. Appropriateness score is: (drum roll please!) a perfect 100!